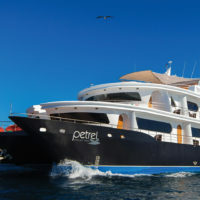 On this five day journey aboard of La Pinta yacht, discover some of the most beautiful islands in the Galapagos. 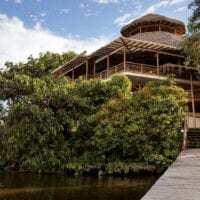 This itinerary begins on Santa Cruz Island, the most populous of the archipelago, where you will meet giant tortoises in the wild and then venture to the shores of South Plaza, Santa Fe, San Cristobal and Española Islands. About the vessel: La Pinta yacht provides a sophisticated, upscale travel experience for 48 guests. It has 24 outside cabins that combine modern design, spacious rooms, and gourmet cuisine with top adventure. All cabins have air conditioning and private facilities. Three public decks include an ample bar-salon, dining room, natural history library, sky bar and sundeck. A Jacuzzi and gym complete the on board amenities. With 8 connecting cabins available, it is an ideal yacht for families travelling together. Explore Galapagos eastern islands including South Plaza, Santa Fe, San Cristobal, Española and Santa Cruz. Your Galapagos Cruise include: Accommodation in selected cabin, all meals, Island sightseeing, English speaking naturalist guides and lecture services, Free consultations with a 24/7 medical officer, snorkelling gear, shared transfers in the islands and from main hotels in Quito and Guayaquil. On arrival, you will be met at Baltra airport and transferred to the dock to board Yacht La Pinta. There’s a welcome introductory briefing, boat drill, cabin assignment and then lunch. You will start sailing for your first afternoon outing. PM: South Plaza Island- The turquoise waters of the channel contrast brilliantly with the white sand and black lava of the shoreline. While a carpet of scarlet Sesuvium succulents serves as ground cover for a grove of luminescent green Prickly-pear cactus beyond, populated by yellow-grey land iguanas. Along the coastline there are Sea Lion colonies, while sea birds play with the thermals that form along the cliffs of this small but spectacular island. AM: Santa Fe Island- Take a dinghy over to this idyllic sandy-white beach populated by colonies of sea lions. Galapagos hawks are often easily observed, perched atop salt bushes. The Santa Fe land iguana, unique to just this island, may be spotted during the walk. Following the walk, you can snorkel and swim along a natural wave barrier or ride the glass-bottom boat. PM: Cerro Colorado Tortoise Habitat- After lunch, disembark at Puerto Baquerizo Moreno, the island’s capital, and drive 40 minutes to the island’s southern shore. At Cerro Colorado, visit the breeding centre for highly endangered giant tortoises in the midst of a fantastic deciduous forest, home to dozens of bird species, including the San Cristobal Mockingbird, and the San Cristobal Lava Lizard, both island endemics. AM: Punta Pitt- Land at the eastern tip of San Cristobal Island this morning. The trail that ascends from the beach provides spectacular views of the shoreline; you can observe Frigates, plus a colony of bachelor Sea Lions. After the walk, if conditions are favourable, there is a chance to swim and snorkel. PM: Cerro Brujo- In the afternoon following lunch on board, a dinghy ride along the shores of tuff-stone layers will take you to Cerro Brujo’s expansive, white coral beach, great for walking, with rewarding bird-watching featuring seabirds and shore birds. Also, look out for Galapagos Sea Lions. These are the same shores that Charles Darwin walked upon, back in September 1835. AM: Punta Suarez- Your morning, outing at Punta Suarez, provides an exciting walk on lava/boulder terrain to visit its unique sea bird colonies, including the Waved Albatrosses (April to January), Boobies, Swallow-tail gulls, and the famous “blowhole” lava formation. Also, look for red-green-black Marine Iguanas. Many regard this site as the best in the Galapagos. Back on board for lunch. PM: Gardner Bay- In the afternoon, set down at this beautiful, white coral beach for a short walk to observe the Sea Lions, Mockingbirds, Finches, or enjoy the beach. There is great snorkelling in this area, or else there’s time to kayak or ride the glass-bottom boat. AM: Charles Darwin Research Station- Disembarking in the morning and visit the Research Station and the captive rearing programme for the Giant Tortoises. Witness the efforts and results of Galpagos fieldwork and study done in the name of science. After the tour transfer to the airport to take the flight back to the mainland.